What more good than that our beloved American DJ, Marshmello is touring India as a part of the Vh1 Supersonic festival, has released the music video for his first Hindi track, Biba. The video is a tribute to Bollywood musicals, and what more that the video also features our king khan the Shah Rukh Khan. Co-composed by Pritam, Biba features dance moves which resembles Dola Re Dola, the track from Devdas. Other than this, there are a few additional references to Shah Rukh’s movies, for example, the basket ball scene from Kuch Hota Hai and the train sequence from Dil Se. 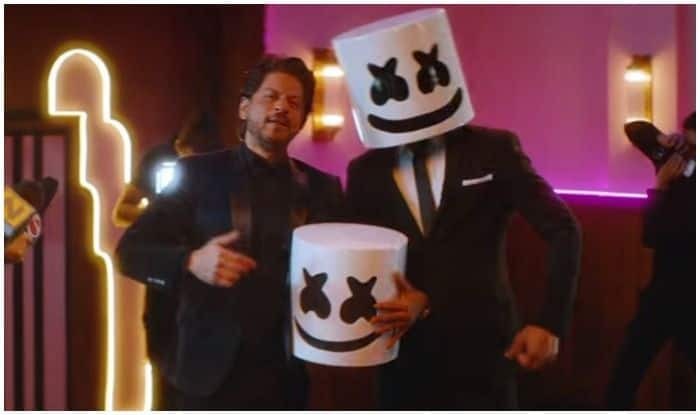 Biba indicates Marshmello viewing a Bollywood film, in which a man wearing his mark headgear is seen striking SRK’s well known pose, a reference to Dilwale Dulhania Le Jayenge. This is mixed with shots of a red carept, then Marshmello welcomes another man, additionally wearing the headgear. The man takes the headgear off to uncover himself to be Shah Rukh Khan, who looks the camera, focuses at the DJ and says, “Marshmello. Naam toh suna hoga ?”. Vh1 Supersonic will likewise include performances by Jaden Smith, Rudimental and Two Door Cinema Club.